You may associate ammonium nitrate with explosives; it's commonly used in safety explosives and pyrotechnics as well as fertilizer. But not all ammonium nitrate experiments end with a bang. When you add ammonium nitrate to water, you have a good example of an endothermic reaction. Adding ammonium nitrate to water turns the mixture cold and is a good example of an endothermic chemical reaction. The chemical compound ammonium nitrate, a salt of ammonia and ammonium and nitric acid, is a colorless, crystalline solid that is highly soluble in water. Its chemical formula is NH4NO3, meaning it is a molecule made up of atoms of nitrogen, hydrogen and oxygen. Ammonium nitrate consists of ionic bonds packed tightly together. When it comes into contact with water, the polar water molecules interfere with those ions and eventually make them disperse. It takes energy to do this, which is absorbed from the surroundings and makes the solution cold. While some heat is produced when the ammonium nitrate ions interact with the water molecules (i.e., an exothermic reaction), it is a lot less than what is needed for the water molecules to disperse the strong ionic bonds of the ammonium nitrate, so the overall process is an endothermic reaction, or one that absorbs energy from its surroundings. It's for this reason that solid ammonium nitrate is used in commercial cold packs, which are really just a mixture of ammonium nitrate and water. If you hurt yourself, you can mix the contents of the bag together and place it on the injured part of your body. 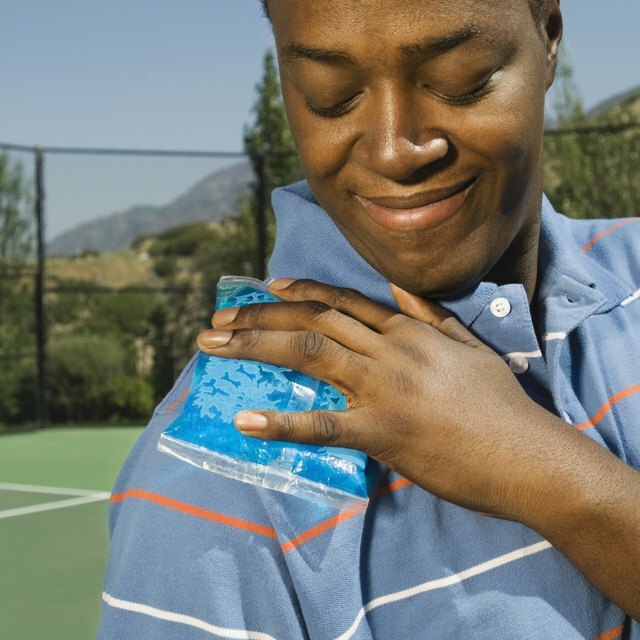 The endothermic reaction of the mixture of ammonium nitrate and water removes heat from the part of the body, "freezing" the painful area. If you gently heat ammonium nitrate that has dissolved in water, the solution breaks down to release nitrous oxide, commonly called laughing gas. Known as thermal decomposition, when the solution decomposes into nitrous oxide and water vapor, this process requires a temperature of between 180 degrees Celsius (356 degrees Fahrenheit) to 250 degrees Celsius (482 degrees Fahrenheit). This should only be done under controlled, supervised conditions in a chemistry lab because ammonium nitrate can cause asphyxiation if too much of it is inhaled, and it can explode at high temperatures. Because solid ammonium nitrate can undergo explosive decomposition when heated in a confined space, its shipment and storage are subject to government regulations. Gillespie, Claire. "What Happens When You Add Ammonium Nitrate to Water?" Sciencing, https://sciencing.com/happens-add-ammonium-nitrate-water-8262206.html. 26 April 2018.